For a minimal fee to cover wear & tear, GMS supplies all the necessary equipment for tansplanting seedlings. If needed we can supply a fully contracted transplanting service to assisit your project. Have a suitable 3 point linkage tractor ready. Generally a 60 hp plus- tractor with 3 point linkage. Make sure there is a working top link arm (this is critical for the height adjustment of the transplanter) with the tractor and that the tyres have suitable air pressure. 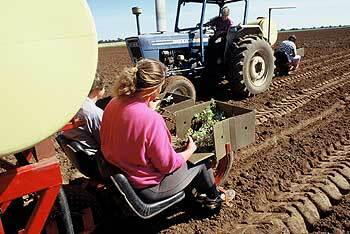 You will need a water cart for filling the omsb transplanter. The transplanting unit holds 600 litres of water and uses 4,000 to 5,000 litres per day. A transfer water pump for filling the transplanter unit water tank. 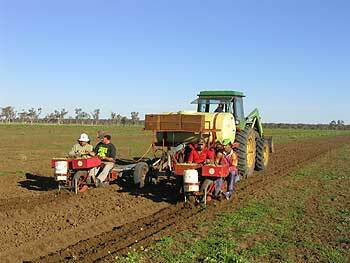 You will need 3 people to operate the transplanter unit - tractor driver plus 2 people on the transplanter. An extra person is sometimes helpful for assisting with keeping the transplanting team going smoothly and for checking on the accuracy of the transplanting operation. If extra staffing are needed for your project, we can assist by supplying our trained nursery staff. Pricing for this on application. Seedlings are stored best when the leaf is kept dry and the roots remain moist. 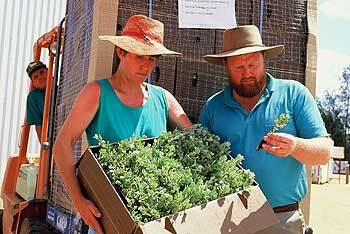 If seedlings in the boxes are kept too wet or boxes closed up for too long or have poor airspace around the boxes ? the seedlings can sweat in the boxes and then the plants will become slimy and unsuitable for field planting. Stack the omsb seedling boxes in a cool shed and in groups no more than 4 boxes high. Make sure that there is a good airspace around each group of boxes. Boxes will last 7 days like this and without needing any additional waterings. If you know that you need to store the boxed seedlings for more than 7 days, spread out the boxes on the shed floor and open the lids. Check the moisture of roots daily. Generally the driest omsb seedling roots are first observed at the edges of the waxed boxes ? so check the edges and not the middle of the box. If dry try and water the boxes so that only the roots become wet. Try to keep the leaves dry. For storage periods greater than 2 weeks - use a coolroom as soon as it is apparent that long-term storage is needed. Plants will last 3 to 4 weeks like this. Good day to avoid cops. Crawl to school.